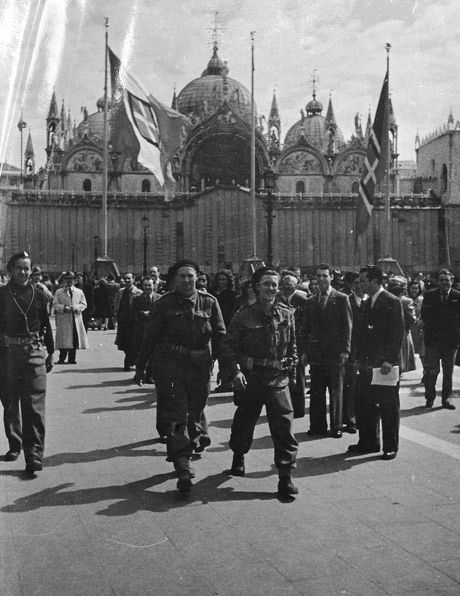 Allied troops in St Marks Square, Venice. We are pleased to announce our annual Beyond Enemy Lines workshop, which this year will take place in Venice on 7th and 8th July 2016. Organised by Lara Feigel’s project team, and graciously hosted by Ca’ Foscari University, this year’s conference will once again gather together an international network of scholars, but will adopt a slightly different perspective from previous years. While our last two workshops in Berlin (2014) and London (2015) focused specifically on the Allied occupation of Germany after the Second World War, this workshop takes a comparative approach: by examining the status of culture in a range of different military occupations we hope to highlight the similarities and differences of the German case. 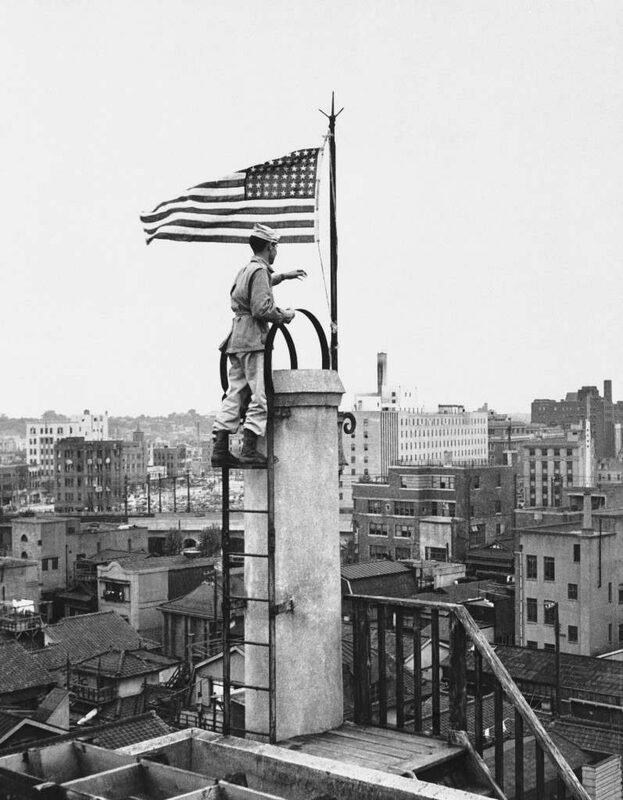 U.S. flag flying over Tokyo following the Japanese surrender. The workshop will consist of a series of discussions led by experts in the relevant field: we begin with a session on the Allied occupation of Italy led by Professor Robert Gordon (Cambridge University, U.K.), followed by a discussion of the contemporary occupation of Japan chaired by Professor Hiroshi Kitamura (College of William & Mary, U.S.). Having examined these contemporary historic examples, on the second day we will move towards considering the role of cultural interventions in more recent and ongoing occupations. A panel chaired by Dr Rochelle Davis (Georgetown University, U.S.) will focus on the occupations of Iraq and Afghanistan, during which the occupation of Germany has frequently been held up as a positive example, and viewed as the ‘model occupation’. 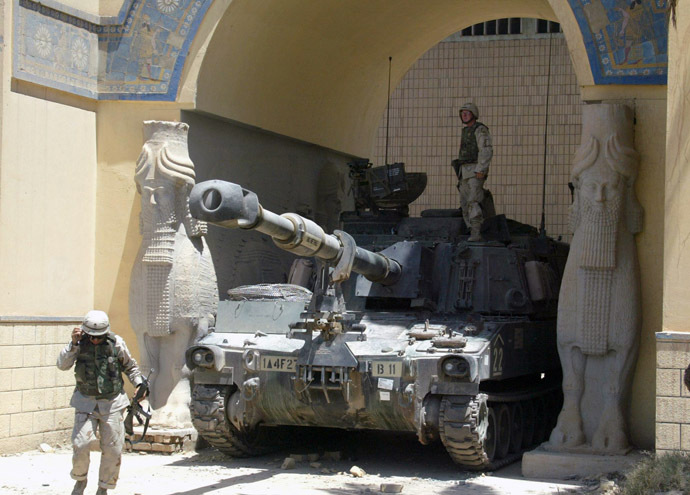 U.S. tank blocking the entrance to the Iraqi National Museum. We will then hear about independent cultural initiatives in these areas from Ted Hodgkinson (Senior Programmer for Literature and Spoken Word at Southbank Centre, London) with examples drawn from his work with U.K. and Iraqi poets, as well as the British Council’s engagement with cultural relations. Finally, we will consider ways in which different occupations have been memorialised and what role this memory plays in the role assigned to culture in current military occupations. 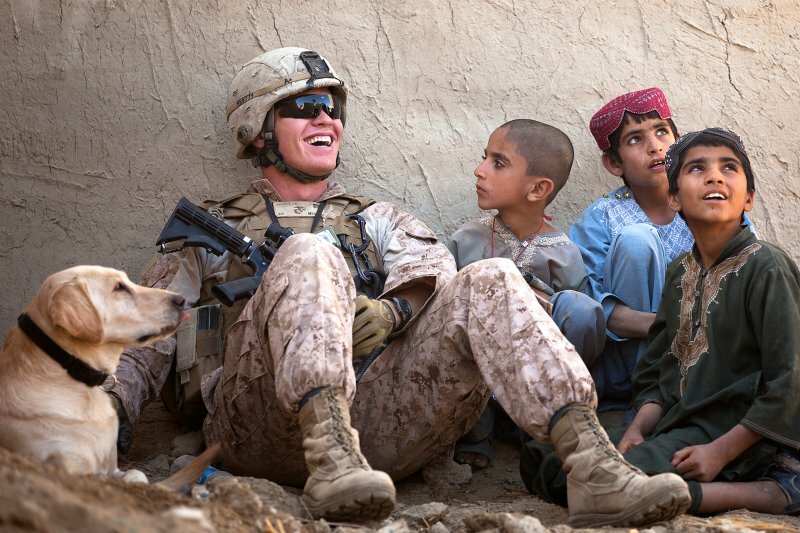 U.S. marine talking to Afghan children (2011). As we read through the fascinating material provided by our guest speakers ahead of the conference, we look forward to intense discussions and unexpected insights in a beautiful Venice setting. Click here to listen to the ‘Comparing Occupations’ podcast that emerged out of the conference.